Last week I had plans to make a cupcake that looked like a candy corn but after two failed attempts I gave up. What I did find was this great recipe for pumpkin cupcakes. When I made this batch I decided to brown the butter to add a richer, nuttier flavor plus, I love browned butter with squash. I like this pumpkin cupcake because it comes out light & fluffy not heavier like a pumpkin bread of muffin. Matt inspired the idea for the dulce de leche frosting by printing out a couple different recipes for dessert featuring it. I planned to go the simple route & just buy a can of it but the grocery store I was at didn't have any & I didn't feel like running from store to store looking. So, I ended up buying a can of sweetened condensed milk to make my own. 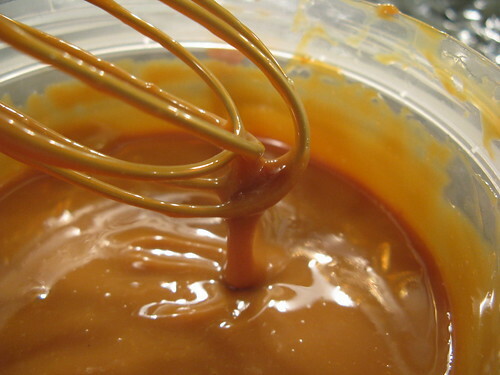 This was our first time making dulce de leche & it was actually quite easy. You just take the label off a small can of condensed milk & poke two venting holes in the top. Place the can in a pot with the holes facing up. 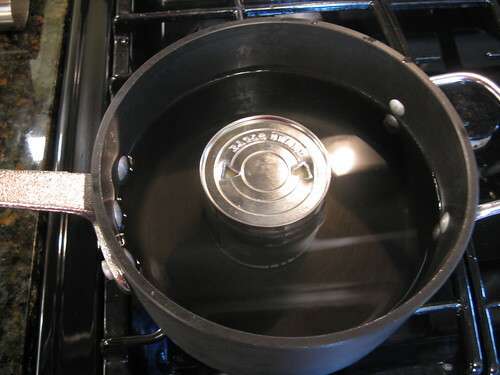 Put water in the pan up to 1/4 -inch from the top of the can. Bring the water to an easy simmer. Allow the can to simmer in the water for about 4 hours, adding more water as needed. The condensed milk will thicken & change to a dark golden brown. In a small skillet melt the butter over medium-low heat. Cook the butter over low heat stirring from time to time until it is a golden brown & smells nutty. Keep an eye on it so it doesn't burn. Remove from the heat & allow it to cool. In a small bowl whisk the flour, baking soda, baking powder, cinnamon, ginger & nutmeg together & set aside. In another bowl lightly beat the egg. Whisk in the sugars & cooled butter. Add the dry ingredients & whisk until smooth. Finally whisk in the pumpkin & maple syrup. Divide the batter between the 6 prepared muffin tins. Bake for 20 -22 minutes, a toothpick inserted into the center should come out clean. Allow to cool completely on a rack before frosting. Beat everything together with an electric mixer on medium until smooth, about 3 minutes. If the frosting is not stiff enough add more powdered sugar 1 T at a time, beating for about a minute with each addition. Do you know if poking the holes eliminates the risk of the can exploding? I am such a chicken. Everything is better with dulce de leche! And browned butter. Wow these look so delish! Hmmmm that sounds heavenly. You are a brave sould arent you with that Dulce de Leche. I have been wanting to make it as well. Those knitted pumpkins are totally cute. I know you knitted those li'l punkins for this post! Mm caramelized butter AND milk? This is going to be great. This won't be light on flavor for sure. Cooking a can makes me nervous, though. "Bake for 20 -22 minutes, a pumpkin inserted into the center should come out clean." You're deffinitely right about the browned butter, YUM! These sound DELISH! I just bought some Dulce de Leche for a Recipe Girl recipe (LOL) guess I'll need to go back for another can for your recipe. 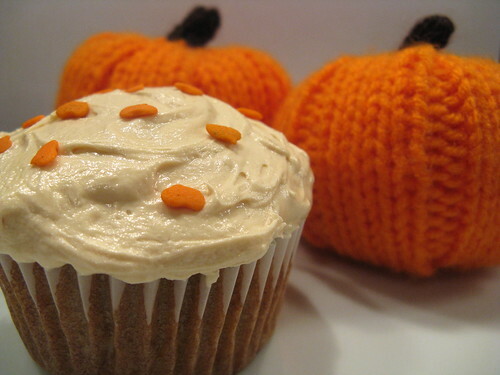 Pumpkin cupcakes are one of my favorite fall treats. These sound pretty tasty. The batter looks so silky. great idea for the icing--i'm sure they're magnificent cupcakes. I can't believe you had any left to put in your coffee! Give me a can of that and a spoon and it is all over. 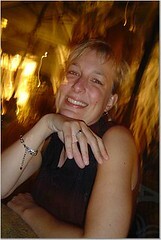 I've included this in my round up! Holy yum!!! Thanks for the info!